This is a really important article from NPR that I shared on our Facebook page a few days ago. It talks about postpartum psychosis, which is when a new mother has a break from reality. This illness is rare, but not as uncommon as you would think, because most women are too afraid to talk about it. According to the Massachusetts General Hospital’s Center for Women’s Mental Health, only 1 to 20 women per 1,000 will have this disorder. But here’s the thing: women are, consciously or subconsciously, held by society to be mothers. Women who fail at this in one way or another are judged harshly. Women whose mental health suffers and affects their children are dealing not only with the stigma of “bad mothering” but also with that of mental illness. I am going to say this one time only: mental illness is just another kind of regular illness. The brain is just as much a body part as the pancreas, but one would never judge a mother with diabetes for needing to stop to adjust her insulin, or for needing insulin in the first place (well, at least we tend not to judge those with Type I diabetes – the stigma against fatness is a whole other blog post). Sometimes our bodies fail us. It is simply a part of being a living creature; we are imperfect. And I do not deny that mental illness is a challenging thing to deal with. Unlike many other physical ailments, it can affect personality and that is truly a hard thing for those who suffer with it as well as those around them. 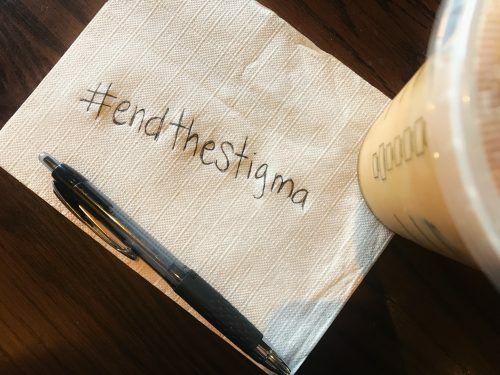 But it doesn’t make the stigma any more valid. And the stigma is built into the mental health system, too. For instance, in trying to find care for my daughter (it is okay with her for me to discuss this publicly), we were met again and again with limited care for mental health. There are clinics here who will only see a patient for 13 visits, with a second set of 13 visits possible if still necessary, but no more. This may be logical for a kid who is simply needing to learn some coping skills or needs help navigating difficult interpersonal connections. But for a kid with a true mental illness, it is simply not enough in any way, shape, or form. You’d never find a medical hospital with a 13-visit limit on any other kind of care. If a child goes through the expected number of chemo sessions and still needs medical help, they will get appropriate medical care. But this isn’t true of mental health care. The stigma is built into the system itself. If you read that NPR article, you will see the difference between care models here in the US and those in the UK where babies are sometimes allowed to stay with mom. Here in the US, however, infants are not even allowed to visit and breast pumps are not readily available. This is a woman’s problem in that it affects women directly, but it is a social problem when we consider the time off work the woman’s partner will need to take, the childcare involved of the infant and/or older children. Something like this could make or break a family’s survival and here in the US where we don’t offer healthcare to everyone, health problems often do break families, forcing them into poverty and potential homelessness. I’d also like to quickly note that, yes, police can be involved in mental health cases where it is not safe to transport a person yourself. If you need to call for care (at least here in San Diego – you will want to look up your own local information) you should ask for the PERT team (psychiatric emergency response team). They will handcuff the person while transporting them and, while this is often perceived as treating them like criminals, it is not the intention to do so. It is done for safety and probably policy reasons. Perhaps this is something we need to work towards changing – I’m down with that. But I’m sharing this right now primarily because I think this is important information for the general public to know – it’s certainly not something you want to be surprised by at your lowest moment, and it’s something that can be so easily misunderstood. So, what do we do about this problem of mental health care, in particular as it pertains to women? Well, first of all, we share the facts. Women are at a disadvantage when it comes to appropriate medical care. People struggling with mental health issues are at a disadvantage when it comes to appropriate access to services and care. Women struggling with mental health issues are dealing with this from every angle, and women of color or other oppressed groups are oppressed even more. So talk about this. Share the facts with your friends and family even if – especially if – they do not pertain directly to you. A voice outside the community can be a powerful ally. Second, listen to your friends and family when they speak of their mental health issues. Do not tell them how to fix it, do not offer suggestions. Instead just tell them that you hear them. Offer to help them find services (here in San Diego the Access and Crisis Line is your first stop). Promise that you don’t judge them and that you love them. Remind them that this is just another illness like any other illness and the fact that it is happening in their head doesn’t make them any less worthy of help or love. If – and only if – you are ready to share your own story of struggling with mental health, share it. The more people admit secrets, the more we find we are not alone – just like with our pictures of our bodies here, we can stand together and be stronger than we are alone. If you want to share your story here, you can do that here. And if you are a mama or a parent who has struggled with mental health issues of any severity, I am here to tell you that you are not alone and that it does not make you a bad parent. You are worthy of love and life. It is scary sometimes to seek help, and I will admit that sometimes even mental health practitioners are terrible at understanding mental illness, but keep moving forward. Don’t allow yourself to believe anyone – professional or not – that mental health problems are something you should be ashamed of. It’s simply a thing that happened, just like any other challenge people face, no stigma necessary, no judgement at all. You are strong and worthy and beautiful just as you are. I see you and I hear you. I was allowed to have a manual breast pump – it does not hurt to ask – and I was also able to go off ward (supervised, of course) to meet with my son and husband in a conference room nearby – again, it does not hurt to ask. It wasn’t ideal, but it was something. I’m so glad you were able to have access to your baby and to a breast pump! I agree – always ask! But I also hope that someday we can get to the place where it is simply expected (by the hospital staff).